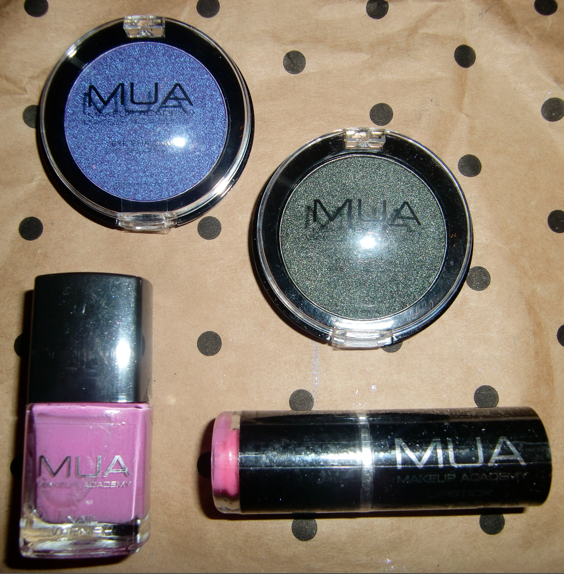 So, the long awaited Makeup Academy (MUA) range has been released at Superdrug. 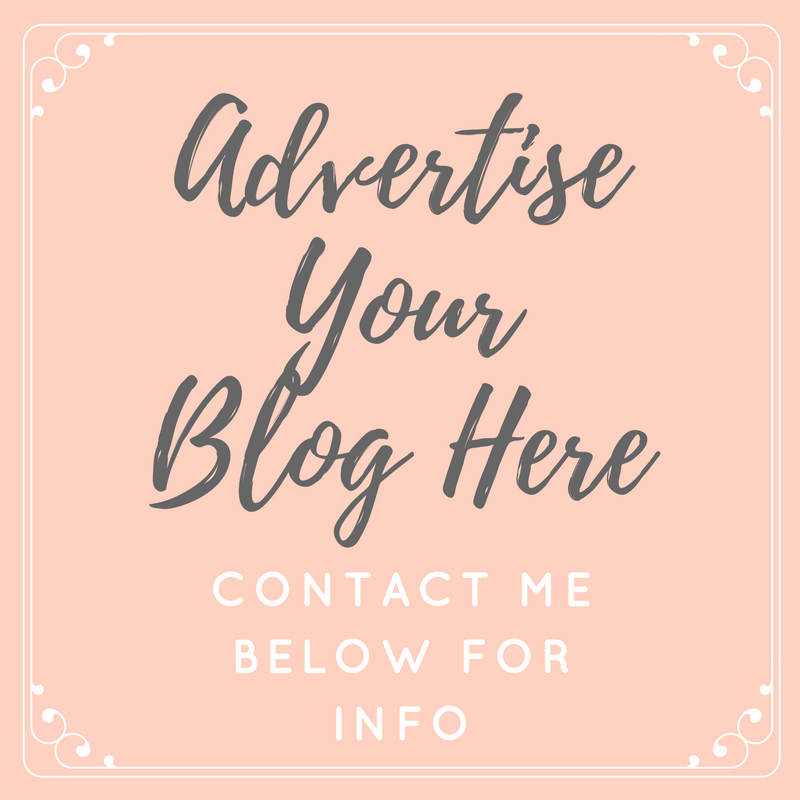 They have eyeshadows, lip gloss, lipstick, mascara, blushers, bronzers, nail varnishes and more, all at an amazing bargain price of just £1 per item! I was never expecting a lot from these products, simply because it's hard to believe that you are going to get decent quality cosmetics so cheap. However, I was very curious, and decided to drive 40 minutes (to the closest Superdrug actually stocking the range) and buy a few bits to try out. A lot of the products were already sold out when I got there… mainly the eyeshadows, but I set upon having a nosey at all the testers on display. 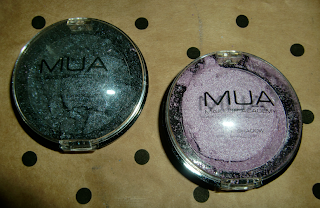 My initial thought was no wonder the eyeshadows were running low… they are amazing for £1! Okay, so the packaging isn't very appealing, it's very plasticy and plain, but it doesn't really matter does it?! 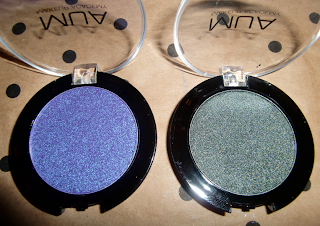 I was surprised at how pigmented the eyeshadows all were! With just one swipe of my finger then onto the back of my hand, I was given a great swatch of colour. The ones I tested were all quite metallic looking, and a little sparkly, and all stunning colours. I chose Shade 4, 9, 10 and 14. I was gutted to see that when I got home shades 4 and 10 had smashed in my bag… I'm not going to bother returning these though… not really worth it for £1 each, I'm just going to try and savour what I can. I swatched quite a few of the lipsticks, some were very sheer and others were very bright and gave a great colour payoff. 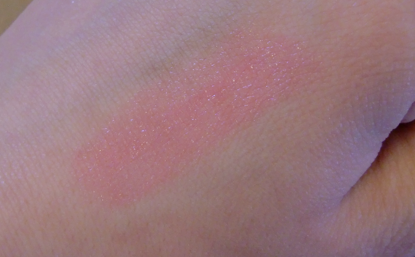 I only bought one however, and the one I chose was shade 4, which is a very sheer, slightly glittery light pink. I mainly chose this because it actually looked like a gloss on the back of my hand, and I don't like the feel of lip glosses on my lips (too sticky for my liking) so I thought this could be a bit of a substitute. 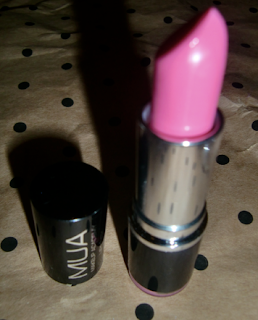 The packaging of the lipsticks is much nicer than that of the eyeshadows. They look quite classy, and I love how you can see the colour of the lipstick without opening them (like the NYX lipsticks) - such a good idea! All in all, I'm really impressed with these products. For £1 you can't go wrong, and it gives you a great opportunity to try new colours and products. I will definitely be trying some more bits. The only thing I don't really like is the names, 'shade 1, shade 2 etc is a bit boring and unimaginative, but like I said with the packaging, it doesn't really matter at all. The MUA range is available in 84 Superdrug stores nationwide, find your nearest stockist here. I wasn't interested in this brand at all but I am quite curious now, the lipstick looks lovely and one coat for the nail varnish? wowzers! hell of a good for £1. I don't like the names either, normally names help you decide what the colour is like, like coralacsious - obviously a coral, but its hard to determine with these unless you swatch them all. ooh I want to go in town now! That's rubbish they smashed! But the colours look great, I'm quite impressed with this range for the price based on other blogger's reviews, I;m looking forward to trying a few. I love the eye shadows, I totally agree with you, they're really well pigmented!! I really want to try some of these products, but they don't stock them in my local Superdrug :( They look great though for only £1! I really want to try some of the things they have! i have loads of superdrugs near me so hopefully one of them will stock them. eyeshadows look great! The lipstick and nail polish are gorgeous!! These are so gorgeous. I'm wondering if they're going to come out with this line in the states sometime. I was having a nose on the superdrug website at them MUA stuff earlier, think I might order off the internet instead of going into town and finding it might be sold out!